Does anyone know whether removing or disabling the factory-installed alarm system in a new car will reduce emissions? Hardly or not at all!.. Most emissions come from the wires running through the steering wheel and wires running to the back of the car for the brake lights. Also some from the engine compartment in some cars that can come all the way inside.. and at the wheel wells the wheels contain steel, so when they spin they create a E/M field. You can get a de-gausser and de-gauss your wheels, that would be significant compared to disabling the factory alarm. With the factory alarm you only get emissions when you press the button on the remote, and it's very very low on most cars. If the remote only works from a few feet away you know it's low. If it works from hundreds of feet away, then it's stronger. With cars, you just have to pick the right one, I don't think there's much modification you can do, other than the tire thing. I haven't done it so I don't know if it helps.. rent the car you want to buy from a rental place if possible and drive for a while.. then compare with others. Another thing to consider is adding metallic tint, which block out RF, but is hard to find.. you need an "all-metal" tint, there are some metal+non metal mixtures that don't work very good. You can encase your RF meter with the tint and see how much it blocks before installing.. You'd have to ask an installer for a sample though, and they may think you're crazy =) But there are still some installers who carry metallic tint, but not many because it's hard to install. Of course you still have the big open windshield.. but somehow this helped for me. Many cars have radars now, so at least if you do the back windshield I think that helps a lot. maybe rear windows too.. Haven't had an issue that the level is multiplied because the tint is "trapping" rf... but I only have rear windows and rear windshield done, the front has a weak metal film that barely blocks. Thanks for your reply. This is very helpful. I will look into the tires. I find that when all the windows are open my reaction to the car is less severe, so I'm hesitant to tint the windows. But anything that reduces the emissions at all would be helpful, so I'm going to start with the tires. Have you tried any of the devices that supposedly "convert" the negative fields to positive ones? There's an adapter a person can buy, which plugs into an outlet in the car and supposedly helps with electrosensitivity. Also, there are magnetic cards that a person can wear or put on their dashboard, which are somehow supposed to reduce harmful fields. I'm hesitant to buy any of this stuff if I haven't heard of it being helpful. Then again, if even one person found one of these devices helpful - someone not giving a testimonial on the seller's website! - I would go ahead. There are EMF protection devices that people here have reported positive experiences with over the years. Unfortunately though, just because one person experiences a benefit is no guarantee that *you* will experience the same benefit. Many of the devices that I personally use are no longer sold, as they are quite old, so that's no use to you. However, you might try something from "EarthCalm" or "Pulsor" or "Gia", as there have been multiple people reporting improvements from using products from these companies. Thanks for the reply. I will look into devices from these companies. I'm also considering buy a lab coat - shielded of course, and/or putting a shielding blanket over my lap when I drive. Amazon sells shielding blankets for pregnant women, which might to reduce the prickling sensations caused by car emissions. I talked with someone who owns a tire shop where I live and he's never heard of degaussing. He did say that if I get a degausser, he's open to trying it -- meaning he'll get my car off the ground, get the tires spinning and use the device. You should also note that while shielded clothing works for some people, for others it makes symptoms worse. Something about the metal concentrating fields next to your body. Oh, I see that one of my "top 2" EMF protection products, "Springlife Polarizers", *can* be purchased on a few sites online. I had thought they had gone out of business entirely 10+ years ago, but I guess not. Here is one site that has a few items available. I would place this brand above any of the other brands I mentioned previously. Thanks for this information! I'm going to look into these products. I did find a problem in the car that I've corrected: the bluetooth. The salesperson told me that since no devices were connected, it meant the bluetooth wasn't radiating, but he was wrong. When I went into settings, I found that the bluetooth was turned "on" and I turned it to read "off." Turning it off has already made a huge difference. That's nice that you can turn off the blutooth in the settings. Some people have to pull fuses, or disconnect the blutooth hardware. Less severe with windows open may suggest you're reacting to the toxins in the car maybe more than EMF. Remember that cars have a huge range of pollutants that they're made out of.. even mercury!! 2012 Honda Civic was the best tested. I don't know how much to trust that list though.. I think it's just an indicator that cars do have a lot of toxins.. and it will vary from car to car, depending how old it is and what it was made out of.. the spare tire is one of the worst things in a car in my opinion... it offgasses a lot of crap, I smell it. I kept mine out for a while to offgas, but still it hasn't all the way..being in the trunk the gasses come in the car. To deguass the tires you need a degausser, which can be found on ebay cheap, but it will generate a huge magnetic field, so for someone EHS, likely it's not a good idea... maybe if you can find someone to hold it for you, and there's a very specific procedure that has to be followed.. like spin the tire at steady speed while holding it close and then gradually bringing it further away. I haven't tried it because of the huge magnetic field a degausser would make. The car would need to be jacked up, and the tire spin at a steady speed somehow.. it's not super simple, but it's possible... a drill chuck could likely be spun against the tire and turn it. To help neutralize the effects from electromagnetic fields in my vehicle, I take a couple magnesium glycinate ahead of time. Thanks for all these replies. I just bought magnesium (the kind you mentioned) yesterday. I think I am partially reacting to the toxins in the car, because the inside of the car was Scotch-Guarded when I bought it and my reaction at first was severe. Detoxing is a good idea, hard to do, but possible. I do eat well - no sugar, but detoxing involves so much more than that. I want to go ahead and get all the metal out of my mouth in the New Year - all the mercury fillings. When I first became sensitized that was the first avenue I explored and found it helped a lot, but I didn't complete the job. If all else fails, I'll sell the car. A 2012 Honda Civic shouldn't be too hard to find -- if I let all the Honda dealers know I'm looking for one. I think leasing or renting for a few months is a good idea. There are more cars on the list I posted, but again I think you should take it with a grain of salt.. They did two 2012 Civics and one was better than the other, .. maybe different models, who knows. Maybe it even varies across manufacturing plants and where the parts are sourced. I buy a lot of things to do home renovations and I've found that most manufacturers are not consistent with their products. One may smell more one may smell less.. Even light bulbs.. it all depends how the plastic was mixed. I use magnesium oil because I feel it works better/faster than bisglycinate and it's cheaper too. Just put it anywhere... arms, legs.. it will get sucked in through the skin, but it causes itching, so you have to rinse it off pretty soon after putting it on. Dilution helps. You're going to a dentist that gives you an external air mask to wear and uses a dam when removing those filling right? I figured scotchguard wouldn't be very good, so I never touched it.. but still I think the new car I had from Subaru was very poisonous.. although it didn't smell a lot. The Corolla I have now smelled more, but seemed to cause less problems. Each manufacturer will probably have their own similar type of circuitry I think across their cars. Maybe Subaru just has something special that isn't so great.. I drove another Subaru and I didn't like it either.. but it was fully features with electronic gadgets everywhere. Probably the more basic the better... I'd guess an old Corolla and Civic would be very low on electronic stuff, they were very basic cars.. Yes, the dentist I go to specializes in mercury removal - I wear a mask and he does, too! 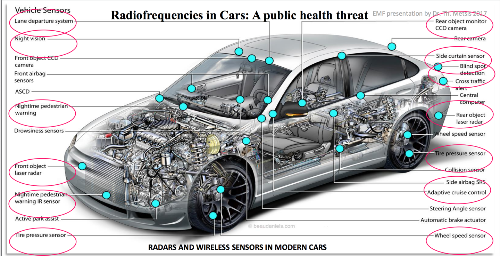 A friend told me that all the immobilizers on cars operate with a wireless modem, which is why he suggests getting rid of the car and buying something else (something old) that doesn't have a built in security system. I could try to get someone to remove the immobilizer, but that might be impossible. The local dealer won't do it. I went ahead and bought radiation attenuation gloves for driving; I'll see if they help. The problem with buying used cars privately is that they can't be leased, only bought. So I'd be selling a new car and buying an old one without knowing with 100% certainty that the one I buy will be any better than the one I took a huge loss on. That makes me hesitate. It's the steel belted radial (sbr) tires that are the problem, according to Dr. Samuel Milham, that are causing the emf. If you can find tires other than sbr, you are golden. Try finding tires made from Kevlar or something else? Thanks, I'll do that immediately. Inquired . . . but impossible to find. One tire salesperson suggested buying static straps and wrapping them around the tire to ground the tire to the road. Don't know how that will make a difference, but it's a low cost investment and he's willing to put them on. What size tire do you need? Wireless modem immobilizer is very rare..maybe only in Germany you'd find such thing. Are you in US? Why do you think you have that? Do you have something like OnStar, or some sort of indicator that your car has communicating capability? I'm in Canada.. cars just have a computer and an encoded key, when you put the key in, the car senses the chip inside the key and it lets you start it. There's nothing like "Immobilizer" any more, those were the old days, where immobilizers were used to cut off multiple circuits and be hidden somewhere. I've installed a few car alarms myself, one immobilizer too, that was imported from Europe. If you do have something with wireless capability, it is absolutely possible to get rid of it. You just cut the power to the thing, or cut off it's antenna.. First though, you gotta figure out if you have such thing, which would be found in the technical manual. The car's ECU(Computer) does not have wireless capability, so it would have to be some other box somewhere.. What car is it? where you can get dealer's service manuals and find out anything about the car, including electrical wiring diagrams showing every wire in the car and every unit+location where the wires go, including wire colors. I've used this to put back together wires on a crashed car that had been completely ripped apart and harness/connectors had to be pieced back together. I'm in Canada. A friend told me it's the immobilizer that's causing me difficulties. I'm thinking now that it isn't. A good test would be to sit in the car for half an hour with the motor off. If I have no reactions, it's not the alarm system. It could be the tires, but getting them degaussed is next to impossible. Probably cheaper and more feasible to buy new tires.